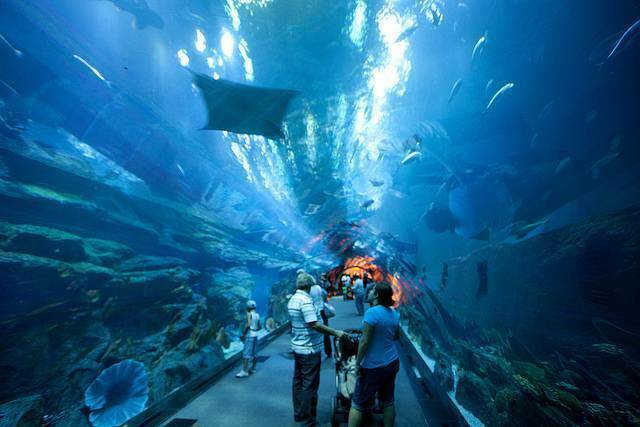 Hidden away from the hustle and bustle of Dubai Mall, the Aquarium and Underwater Zoo is a magical world of its own. A large 10 million liter aquarium hosts a number of activities. Adrenaline junkies can dive into the tank and experience the thrill of coming face to face with predatory sharks and rays. For the slightly less enthusiastic, cage snorkeling is another exciting option. Safe within the four walls of a cage, visitors can watch sharks swim around them from a slightly further distance. The aquarium also offers a 2 day course to become a certified diver! Apart from the underwater activities, the zoo also houses crocodiles, desert reptiles and tentacled species. One must definitely give King Croc, an extravagantly sized crocodile, a visit! At different times during the day, visitors can witness marine life being fed and also watch adorable animal presentations. A little more relaxing tour of the aquarium can be done on a glass bottom boat, where an amazing view of the vibrant marine life below can be obtained. The aquarium, thus, has a plethora of activities to offer, be it relaxing, thrilling or simply for an interesting few hours.